The Art Shanty Projects reveal what it takes to make a lively public space — people, engagement and activity. Photo courtesy of Art Shanty Projects. White Bear Lake is home to Minnesota’s most unusual streetscape. It’s not in the town of White Bear Lake; it’s on it. For the month of February, 20 artist-designed ice fishing houses are set out on the lake to celebrate winter, the tradition of fish houses and making art — all Minnesota trademarks. The distinctive event, perhaps the only one of its kind in the world, includes a flamenco procession, a snowblower ballet, art-car and art-bike parades and an opportunity to “water” an ice garden. As for ice fishing houses, there’s a chef shanty, a ghost shanty, plus one for slumber parties and one just for dancing. And when you add visitors (tens of thousands are expected over its four-weekend run) you get something more than a sculpture collection or an architecture show. It becomes a village — with the fun of a carnival and a sense of community heightened by the surrounding snow and ice. But the projects also show how lively streetscapes come from more than high-style buildings and static public art. They also come from people, engagement and a variety of events. Every shanty is designed not just to look interesting, but to offer sensory experiences — the richness of sound, the smell of wood smoke, the feeling of a rough wood door handle. In this cold, temporary place, there is the sense that art is for everyone and that it can be everywhere in civic life. With its all-black exterior and steeply pitched translucent roof, the Ghost Shanty is austere and clean-lined — hardly surprising, given that five young architects created it. “The shanty itself is intentionally unobtrusive,” said Sean Higgins, leader of the Ghost Shanty team. The idea is not to distract from objects inside. The all-white interior walls are the canvas on which visitors are invited to paint. The team will offer a specific paint color for each of four weekends — starting out with blue, then red, green and orange. At the end of every weekend, the walls will be papered over to preserve the “ghosts” of newest artwork. Photo courtesy of Art Shanty Projects. From 2016, an aerial shot of the Art Shanty Projects on White Bear Lake, home to the annual Art Shanty Project. Other shanties this year include I-C SPArkle-matic — essentially a human car wash, with found objects that prod and poke visitors as they make their way through. There’s also the Sci-Fi Book Club, which looks like an escape pod crashed onto the frozen lake. In this shanty, visitors can write letters to the future or check out books from the sci-fi library. There’s also the Sci-Fi Book Club, which looks like an escape pod crashed onto the frozen lake. In this shanty, visitors can write letters to the future or check out books from the sci-fi library. Within the shanty village is a shared sense of shelter. Between the structures, the shoveled paths act as streets and the open spaces become outdoor rooms equipped with bonfires, signs and food vendors. And there’s a sophisticated accessibility plan so that people of all abilities can visit either with the help of a powered sleigh or on foot. Sometimes the best ideas for urban design come from places that aren’t urban — or even permanent. Events like the Art Shanty Projects can help propel urban design because they challenge assumptions about what makes a successful public space, who can be an artist and where art can be made. These are questions especially relevant for Minneapolis, St. Paul and other cities that are rich in architecture and poor in vibrant street life, chance encounters and new experiences. Frank Edgerton Martin is a Minneapolis-based writer and landscape historian. Here’s a Streetscapes piece I wrote for the Star Tribune on the new Downtown East Commons in Minneapolis. Despite controversies, it’s one of the best new urban spaces in the country. Click on this text to link to original article. The new, much-debated Downtown East Commons park opened to little fanfare. But the people’s park is turning out to be much better than early opponents expected. Downtown East Commons, which opened last week, is a new kind of public space for Minneapolis. While our older parks such as Loring and Elliot are designed to be calming escapes from city life, the Commons celebrates the city itself. Covering two blocks and 4.2 acres, the Commons is a large outdoor room framed by buildings. From the park, you can’t miss the massive, prow-like U.S. Bank Stadium, looming to the east. Looking toward downtown, the city’s skyline sets the backdrop for the park’s west block. More difficult to see are the Commons’ subtle design strategies — the quiet harmony of scale, plantings and materials that add up to a great work of urban landscape architecture. Despite a whirlwind of controversy — including how many days the Vikings could claim the park and whether to close off Portland Avenue — the Commons has turned out remarkably well. 1. It was designed to reveal the space. The process of designing the park included several public workshops early last year, which generated a long wish list of features, ranging from climbing walls and skating rinks to playgrounds, winter ice fountains and public art. If the designers had fit even half of the items on the list into the site, the Commons might have ended up resembling a county fair. Sure, there might be attractions for everyone — but they would distract from the unique appeal of the space itself. Instead, the design team, led by Mary Margaret Jones of San Francisco-based Hargreaves Associates, forged a consensus with compromise and restraint. Going back to Frederick Law Olmsted’s vision for Central Park, landscape architecture is a three-dimensional approach that shapes space, channels many kinds of circulation and affords a variety of uses. The Commons is a brilliant 21st-century expression of this populist ideal. 2. It encompasses two distinct parts. Early on, the Hargreaves team knew that the Commons needed to accommodate thousands of game-day fans and also be a park where neighborhood children could play and downtown workers could enjoy lunch. Their design solution begins with two distinct blocks: one more wooded and human in scale, the other more open to the sky. At the stadium’s doorstep, the east block fills this public role, focusing on the immense Great Lawn planted on the site of the former Star Tribune building. Berms arc around this subtly sloped lawn, framing and sheltering the open space. Those berms also serve as seating for large events. In contrast, the west block is more intimate, with areas for play, as well as a future cafe and fountains. People can bring their lunch, and children will be able to run through jets of water. By locating the new Edition apartments inside the western edge of the Commons space, planners created a human scale. Lined with balconies and home to a future parkside coffee shop, the Edition brings people to the Commons throughout the day and evening. 3. It has topographic character. Hargreaves is well-known for using topography — whether in the form of dramatic flowing berms or subtle grade shifts — to create character and establish a sense of enclosure. Along 4th Street, there’s a long black granite retaining wall. “One of the details I love is that its wooden seats are on a constant elevation,” said Jones. Even though the site slopes 4 feet from west to east, the seating wall appears as a level horizontal band, slicing into the changing grade with a long, smooth cap. Such topographic tricks can be found throughout the park. 4. Its design is restrained and timeless. Hargreaves also is known for the simplicity and clarity of its urban projects. At the Commons, there are no fancy paving patterns or ornamental lightposts and benches. Stair rails, posts, furniture and ground lighting are all made from light metals with smooth, sleek surfaces. Sourced in Babbitt, Minn., the Mesabi granite in the retaining wall and fountain areas expresses the geology of the Iron Range. This restraint in paving and materials makes the variety and texture of the trees and surrounding architecture all the more apparent. 5. Its plantings are plentiful and varied. Thanks to priorities set by the city, the design team was able to plant almost 200 trees, many of them mature. The Commons contains oaks, maples, birch, ironwood and several types of conifers. 6. It connects to the past. Even though it’s very new, the Commons tells stories of the city’s past through native plantings, which set the foreground for historic buildings like the Armory. At 5th Street and Portland Avenue S., you’ll find two distinctive trees — a massive ginkgo and a red maple. For decades, they shaded a small green space across the street from the Star Tribune building. Now they shade what’s called the Good Lawn, a serene and quiet vale secluded by a curving hedge and berms. The new Downtown East Commons covers two blocks and 4.2 acres next to U.S. Bank Stadium on former Star Tribune land in Minneapolis. Folks are already enjoying the green space; Jeff Holz walked his french bulldogs Stitch and Bella, not pictured. Much of the west block recalls the character of Minnesota’s prairies and woodlands. There are drifts of shade plants along 5th Street and a sense of immersion as you walk among prairie grasses and flowers. You’d never know that the Vikings stadium is just a block away. And where else in downtown Minneapolis will you find a glade of maidenhair ferns? Frank Edgerton Martin is a landscape historian and Minneapolis-based design writer. CLICK HERE TO LINK TO ORIGINAL The following is an article I wrote that came our March 18 in the StarTribune. It promotes the idea that “character” in cities is worth discussing. Character” can mean many things and is hard to define. For this reason, it may just be one of the most important things we can ask about architecture, social equity, variety and meaning in urban life. Streetscapes: Which Twin Cities neighborhoods have character? You know when a place has it. Here’s why many don’t. FILE PHOTOS Grumpy’s Bar in Northeast Minneapolis. The character of a place comes from more than its architecture, more than a single building or work of public art, no matter how famous. The evidence of time and change give many cities a patina, a texture and variety that you can almost touch. Yet often, the most important qualities of a place — like character — are the hardest to define. For some, character can mean topography, old stone walls or the sense of connection one feels with neighbors. For me, character is found in cities and towns with old-fashioned supper clubs and locally owned coffee shops. Think of Jax Cafe in Northeast or Cuppa Java in Bryn Mawr. These places feel authentic and original — local, not themed. It’s not just how they look, but what you can do there that matters — meet old friends, write, be alone in public yet feel unobserved. Great cities offer many forms of character through their mosaic of neighborhoods. In our case, think Loring, Camden, West St. Paul, Cedar-Riverside and Powderhorn. Like characters in a play, each is distinct — with its own traditions. We may not relate to all of these neighborhoods, but together they create the whole. Last spring, a local magazine ran an article about the best neighborhoods in the Twin Cities. It celebrated hip places like the North Loop and Lowertown, which have transformed themselves by becoming modern and opening lots of restaurants. It declared Cathedral Hill in St. Paul, downtown Wayzata and Uptown “irresistible” destinations. Superior Street in downtown Duluth, from 9th Avenue, in 1983. Irresistible for some, but not for all. In fact, many Twin Citians feel out of place in such trendy and relatively expensive locales. Too many of us assume that a neighborhood that’s alluring to millennials, creatives and the monied is alluring to everyone. Let’s look at a few neighborhoods and examine their character — or lack thereof. Minneapolis’ Linden Hills neighborhood is an obvious example of urban village character. It’s a planner’s model for scale, mixed use and density. Here, you can spend a summer evening sitting outside with an ice cream cone, going to a children’s bookstore and getting around by bike. The houses are varied in size and style. Lake Harriet is nearby. If, for you, character means contrasts, then the Bottineau neighborhood in Northeast has loads of it. I lived there in the 1990s. Down the street loomed the graceful domes of the Ukrainian Orthodox Cathedral. One block north, there was a small corner bar (now Grumpy’s). At 6 p.m., the bar was filled with older patrons, mostly men. After 8, everyone was under 30 and dressed in black. Just across University Avenue was the venerable Jax Café, old industrial buildings along the rail corridor, grain silos and community gardens. Bars and churches, industry and artists lived side by side here. It’s possible, although harder, to measure character in its absence. In prosperous downtown Minneapolis, many buildings that lent the city architectural and accessible character have been demolished. Landmarks such as the Foshay Tower remain, but it’s the smaller buildings — three to five stories tall, mostly built before 1930 — that are gone. They offered a harmony of architecture, sidewalk urbanity and cultural history. Today, downtown resembles a soaring office park, with showy executive lobbies where modest stores used to be. A recent example of this is the Handicraft Guild Building at 10th Street and Marquette Avenue. Designed by William Channing Whitney in 1907, the Guild’s small storefronts, setback portico and patterned brick make it one of the most character-rich buildings in the city. Founded as an early “makers’ space” for women and a school for art teachers, the Guild helped to put Minneapolis on the map as a center for the arts and crafts movement. Unfortunately, the building’s 1913 addition, which faces Marquette, will be demolished for a residential tower. The smaller original building will likely become an event space — and a lobby. City preservation policies deemed the addition by Hewitt & Brown as insufficiently “historic” to save. But maybe we are asking the wrong question. The problem is not the new tower or even the loss of one of our best small buildings. It’s the demise of our few remaining affordable storefronts. Residential towers, parking ramps and office buildings do not create character of any kind. Mixed uses and small businesses do. If there is character downtown, it’s on the fringes, beyond the high-rents of the skyways. There are few small Asian restaurants downtown or in the North Loop because of rents. But you can find new vitality where they have moved — Eat Street along Nicollet Avenue S. and Central Avenue NE. Also, Loring Park’s side streets, such as Willow and Oak Grove, are among the city’s most urbane. Their character results from buildings of varied size and age that come up to the sidewalk and shape the space of the streets. There are trees arching overhead, many students and residents of all ages. The Handicraft Guild Building in downtown Minneapolis. Oak Grove Street evokes a faded elegance with old apartment walk-ups sited next to new high-end rentals. At the Oak Grove Grocery, one of the oldest in the city, you can find historic woodwork and a cast of characters behind the counter. We spend massive amounts on public art and streetscapes like Nicollet Mall, but the character we’re looking for is often found in the humble places that lend richness to daily life. It’s rarely discussed in architecture and historic preservation circles. Yet, character is part of why we care so much about the places where we live and work. It’s time to talk about it more. Minneapolis writer Frank Edgerton Martin writes about urban design. Eden Prairie and the Edge of Growth. Photo by Chris Faust, Suburban Documentation Project, 1992. “Sameness” isn’t a word that applies to metro-area towns that have unique looks, stories and histories. I recently published the above article in the Star Tribune arguing that the Twin Cities region has nearly 100 suburbs and surrounding communities…all of them different. And many not fitting the bland “suburban” stereotype at all. I used Woodbury, a St. Paul suburb that does fit this stereotype—a place with lots of McMansions and big box stores—to argue that even new landscapes like this are changing and becoming a little denser. It was amazing to read the vitriol in the on-line comments. I suspect that people who write these comments as a hobby lack other hobbies and the ability to read for subtlety and irony. This situation is made worse by the fact that we have very little design journalism in most American cities. Too often, regional newspapers cover new development and building as a real estate story. So if one tries to take a landscape historical approach to seeing variety and difference, people take it as some kind of official endorsement of what is “good” or “bad”, “hip” or “not hip”. And of course, you are accused of being a liberal. Still I stand by this article and hope it can spur discussion. I grew up in the “suburbs” and find them rich in stories anywhere you go. Thanks to the Star Tribune and my editor Claude Peck for publishing this. The following is my article on artists and ice houses—at the 10th annual 2016 Art Shanty event. It’s a winter happening and work of participatory art…. Minnesotans call them “icehouses”. In New England and Michigan, they’re known as “fish shanties” or “ice shanties”. Many people are bewildered by their purpose and appeal at all. Yet, there’s nothing like art to build new sensitivity to the tastes of others. Art and ice fishing reunite at this winter’s Art Shanties event in White Bear Lake—a winter happening that’s been going on since 2005. “It’s like a combination of ice fishing and Art-a-Whirl” says Sean Wagner, AIA whose office NewStudio will be making their second shanty entry. A visit to the historic Craftsman St. Paul Curling Club inspired their first entry in 2014: the Curling Club Art Shanty. The team adapted polyethylene thermal film used in the marine industry to shrink-wrap boats for storage. They stretched it over a small warming house with asymmetrically spaced plywood ribs supported by light gauge metal framing. This year, NewStudio is back with “Artist in a Box”—a 7.5-foot square artist’s studio clad in Black Flamed Cedar and offering broad windows for looking out. The idea is to serve the active plein air painting community in White Bear that shuts down in winter. With the new Box shanty, artists can work in open light through the coldest winter months. Christopher Berry, who helped design both the Curling and Artist Shanties says that this time, they hope to make something more portable and permanent. Artist in a Box is designed to rest on a full icehouse undercarriage. Throughout the year, the shanty can be trailered to festivals as a studio or “art cart”. In years past, there have been anywhere between 30 and 90 artists and shanty builders during the gathering’s multi-week run. Many have lived out on the ice the whole time, even though their shanties are only open to the public on weekends. It must be very quiet out there during the week… a pause to watch the winter sunsets, to be with friends, to think. Most icehouse owners already know this. Now skeptics who fail to see the lure of ice fishing can too. The 2016 On-Ice Program will take place on the surface of White Bear Lake every Saturday and Sunday, 10 am to 4 pm, February 6-28, 2016. The following are a group of articles that I’ve written on the future of downtown Minneapolis including: the rebuilding of Nicollet Mall, the long-term urban development effects of light rail, and a beautiful new branch library by the noted architects, VJAA. Click on titles for direct link to full article! This is an article that I wrote about our much-loved Nye’s Polonaise lounge and polka bar in Minneapolis. The fate of this threatened place touches on social equity, gentrification, local character…and really whether historic preservation matters. It appeared in the May-June 2015 issue of Architecture MN Click on text to link to article. THE PROPOSED REDEVELOPMENT OF THE NYE’S SITE IN MINNEAPOLIS SPURS COMPLEX PRESERVATION QUESTIONS. AMONG THEM: HOW CAN PRESERVATION GUIDELINES ADDRESS PROPERTIES WHOSE VALUE AND SIGNIFICANCE IS MORE SOCIAL THAN ARCHITECTURAL? Can Nicollet Mall’s $50 million renovation meet its lofty goals? The answer lies in knowing what the Mall really is. A rendering of the proposed “Art Walk” area for the redesigned Nicollet Mall. This is a new article that I wrote in response to the third reconstruction of the Nicollet Mall in less than 50 years. It appeared in theStarTribune on March 27. The comments and responses have been many and varied. Many citizens seem to understand that high-design and soon-dated public art will not revitalize this historic Main Street. More and more, it seems that the powerful building owners call the shots in downtown Minneapolis. The Mall is really just a front door for their elite tenants with charming sidewalk cafes where their employees can meet after work. The 4.2-acre park is an unprecedented opportunity for downtown Minneapolis. Can we build it right? DOES THE SUCCESS OF METRO TRANSIT’S GREEN LINE HINGE ON SPEED ALONE? WHAT DOES STREETCAR-LIKE LIGHT RAIL HAVE TO OFFER THAT OTHER TRANSPORTATION OPTIONS DO NOT? Critics of the recently completed Metro Transit Green Line in Minneapolis and St. Paul claim that the nearly hour-long trip between the two downtowns is not a viable commuting option when compared with an express bus or car. But such an argument is only valid if we think of the Green Line as true light-rail transit—a mode best scaled to suburb-to-city commuting—and not the urban streetcar line that it really is…. Home to the crossing of the old Hennepin and Lake streetcar lines, Uptown enters its second century as one of Minneapolis’ liveliest commercial hubs. Here is where the city meets Lake Calhoun, and where architects Liebenberg & Kaplan designed a soaring marquee for Uptown Theatre—an architectural innovation so tall it had to be approved by the FAA…. Here is a draft of a new article in the September-October 2014 Issue of Architecture Minnesota on the LPM Apartments in Minneapolis. In many of my pieces, I explore “connundra”—puzzles about architecture where there is no single answer, but just talking about it matters. Photo below: LPM tower under construction in Minneapolis. January 2104. 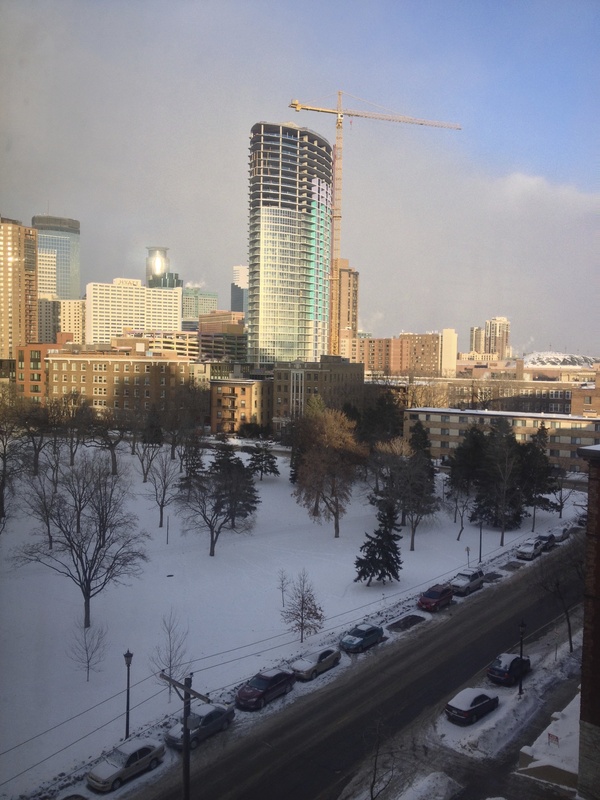 -20 degrees F.
LPM on the Horizon: Is Minneapolis’s Tallest Residential Tower in a Generation Ignoring its Context or Creating a New One? The newly-opened LPM Apartments is a 36-story lozenge-shaped tower that almost seems to sail westward over Loring Park like a tall clipper ship. Sheathed in glass and set atop a rectangular base of structured parking and ground level stores, LPM is a quintessential Chicago residential project—a “platform pedestal tower” built more to the Windy City’s Gold Coast scale than anything Minneapolis has ever seen. Developed by Chicago’s Magellan Development Group and designed by Loewenberg Architects, LPM gleams above foreground masonry buildings like the old Eitel Hospital—itself now high-end apartments. Depending on how you look it, LPM is either very foreign and out of place here or quite beautiful and bold. Like many beautiful people, it is also decidedly slim with sleek arcs of balconies that accentuate its curving walls of glass. Does LPM ignore the scale and texture of Loring Park or is it setting a laudable new standard for high-design and skyscraper scale that can invigorate the neighborhood…and downtown? When the IDS Center opened in the early 1970s, it also stood out like a lone soldier on the plains. Indeed when my freshman college roommate came to visit from New York City one cold January, his comment about downtown Minneapolis was that “it’s a very nice building.” That hurt. But over time, other towers grew up around IDS so that downtown now seems more like a chessboard with a set of pieces, each boasting a distinctively-lit top. Is the soaring LPM just ahead of its time? Chances are that in ten years LPM will have new peers on the horizon and seem more in place. The entire scale of the Loring Park neighborhood and Nicollet Avenue is destined to change, especially with the likely advent of a new streetcar line. While LPM is much taller than its neighbors, its four story wrapped parking pedestal rather nicely matches the scale and massing of Emerson School and older apartments nearby along Spruce Place. But, as some Chicago critics have noted, too many pedestal towers along one street can become overpowering. What if there were five or six such platform towers lining Blaisdell Avenue? What would be the effect of the repeating, blank street wall on stories 2-5? The new generation of tower housing typified by LPM and Nic on Fifth by Opus (also slated to open this year), promise unprecedented hotel-like amenities such as wine cellars and spa treatment rooms for young professionals and empty nesters. They are massive, all-encompassing, and exclusive with rents ranging from $2-3 per square foot so that a studio starts at around $1400 a month. They are a new expression of housing for top earners who can customize their private spaces and experiences, both physical and virtual. Large-scale residential projects like LPM can also isolate new residents from the very city they purportedly repopulate. But, this removal is not just because they are so tall. There are many other design variables that shape the connection between public and private realms. Does the street level have retail spaces for the public? Can you walk though the project as with the nearby Eitel renovation and addition? Do the lower levels have windows and balconies on the street? LPM succeeds in having balconies and planned retail spaces at street level. But, it offers little porosity in terms of drawing the public through its open spaces. And, as the Chicago critics fear, the parking levels are more an opaque “platform” or modern footstool than urban architecture. LPM’s 40,000 square feet of resident amenities are far above the street— draped over the top of the parking pedestal like a verdant tapestry with media rooms, exercise rooms, an indoor dog park and a pet wash.
For those residents who opt for life in a kind of vertical gated community, there is really very little reason to ever go outside. With at least one parking space for each of LPM’s 354 units, they may also find it much easier to drive to the grocery store than to walk there. From the Towers apartments (another Chicago developer project of the 1960s in the Gateway) to 1200 on the Mall designed by Hodne Stageberg in the late 70s, Minneapolis has a tradition of tower housing that combines city views with indoor parking. You can see the city from your windows, but need not engage it. For now, LPM will seem a little out of place: its sleek tower and base set down right next to Jungle Red, a hip hair salon and gallery in a former car wash and a Super America with bullet proof glass at the registers. But developers like Magellan know that if you build at a big enough scale, you can change the neighborhood over time. With new tenants come new stores and higher property values and a cycle of more investment so that the bright little buildings and strip malls often go away. That has been the story of the gentrification of Chicago for years—and now in smaller cities like Minneapolis. Can tall residential towers help to build a 24-hour downtown? Can they add to the city skyline with a scale that makes sense? I suspect that projects like LPM will contribute to our urban vitality—but only if downtown builds at other scales too. No matter how many new luxury residential towers and luxury historic renovations come out of this current development wave, we still need a greater diversity of downtown residents with more options in housing costs, better transit, and affordable rents for individually-owned stores. Downtown Minneapolis has always had residents. In decades past, these citizens were just less affluent, more invisible, and ultimately displaced by growing real estate values and urban renewal. Now that downtown’s population is growing again and nearing 40,000, we need to think of our city’s center not just a soaring “compact core” but as a collection of small neighborhoods, possibly linked by streetcars, each with its own charm and housing choices. That was actually the case a century ago when Elliot Park, Loring Park, and even Nicollet Island each had walkable residential characters of their own. Large-scale towers can work, but only if we also preserve and build with foreground human scale and street life. LPM is now a striking new piece on the downtown chessboard and yet also part of a much larger game. Despite the hype, luxury towers alone do not attract the coveted “creative class” from the coasts. A walkable, surprising, and diverse community does. If we build only such towers, downtown Minneapolis will come to look more like the Post Oak area of Houston, Dubai or one of several other air-conditioned money centers. In a truly vibrant city, private pleasure gardens matter less when there is a richer world of neighborhoods to discover beyond the front door. The following is an article that I wrote for Fabric Architecture magazine on the fascinating history of the companies that make things like mirrors, industrial fabrics, and tents. They tell stories of innovation, daring, and change…. The fascinating and often surprising histories of today’s fabric manufacturers. Many of today’s leaders in industrial fabric began their corporate lives by making something else—mirrors, chemicals, conveyor belt and metal cables. Yet if we consider how these companies grew over the last several centuries, we soon discover that the manufacturing histories of glass, fabric and metal show fascinating connections. For example, Saint-Gobain International was chartered in 1665 by Louis XIV as a mirror workshop. By the 19th century, Saint-Gobain, with the technical requirements of glass making, would branch out into chemicals. Today the company creates a full range of building materials. Industrial products often found surprising new applications bridging industries and embracing the growing technical needs of architecture. In the mid-20th century, the stainless steel wire fabric developed by Cambridge International proved to be an ideal belt conveyor for glass manufacture and its metal mesh later adorned elevator walls in modernist skyscrapers. Today’s oldest fabric companies proved resilient and flexible to change and opportunity. In many cases, the industry’s greatest inventors, often not trained in fabric technologies, were adaptable too. The legendary Walter Bird, inventor of air-supported structures, was trained as an aeronautical engineer at MIT. It was only because the American military desperately needed a way to protect its new radar facilities in the Arctic that Bird hit upon a fabric and air solution. Metal structures interfered with the radar operation. Today, with the rise of new fields such as nanotechnology, first applied to breathable ePTFE fabric by Bob Gore, the strands of chemistry, engineering and function are weaving back together. The old boundaries between materials and their traditional uses are falling away. For example, architectural glass now offers photovoltaic properties and industrial fabrics can illuminate and carry data display. The timeline that follows documents how we have come to this convergence of technology, materials and design through the progress of many of today’s most innovative fabric manufacturers. Theirs is a story of innovation, risk, collaborations and surprising new directions. Editor’s note: This timeline is not meant to be the definitive account. Many companies that do not appear here also have contributed to the industry’s history. Today’s Saint-Gobain is created when Louis XIV signs the letters patent establishing the Manufacture des Glaces de Miroirs in Paris. This and other new glass companies grew out of Minister Jean-Baptiste Colbert’s economic agenda to challenge Venice’s supremacy in Europe’s glassmaking industry. The Manufacture des Glaces de Miroirs (as Saint-Gobain was first known) receives a historic order for 357 mirrors for the Hall of Mirrors in the Palace of Versailles. The Manufacture’s new factory opens at Saint-Gobain (Aisne, France). Saint Gobain establishes a subsidiary to make the sodium carbonate (soda) that it needed to make glass, using the then revolutionary Leblanc process. This was its first venture into the chemical industry. Joshuah Purdy Brown of New York state becomes the first circus entrepreneur to replace the traditional wooden constructions with a full canvas tent, a system that had become commonplace by the mid-1830s. The Pont-à-Mousson company begins as a modest foundry in Lorraine, where iron ore had been discovered. Soon this enterprise would become a world leader in iron water and gas pipes—both essential to rapidly growing industrial cities. The glass industry grows rapidly in the second half of the 19th century. Saint-Gobain strives to fend off foreign competition by merging with its main domestic rival, Saint-Quirin. Saint-Gobain holds 37% of France’s mineral-chemical capacity. It branches out into nitrogen, petroleum, wood and paper between the wars. Estey Wire Works expands their wire cloth weaving division to Cambridge, MD. The Cambridge Wire Cloth Company (predecessor of today’s Cambridge International) is formed with the provision that Cambridge Wire Cloth would only manufacture and sell to Estey Wire Works. Automobile ownership expands nationwide. Roadside tent camping leads to “Tourist Parks” and later hotel courts and motels. Taiyo Kogyo begins as the Nohmura Tent Company in Osaka, Japan. Cambridge Wire Cloth begins production of its second product line—spiral woven wire belt—with a request from a Baltimore customer, which would be the first of the metal conveyor belt line of products. “Allegheny Metal” is introduced at Cambridge International. This alloy of nickel, chrome and iron—now known as “Stainless Steel”—pened whole new markets for wire fabric because it is rustless, corrosion resistant and able to be used in extreme temperatures. Walter Bird graduates from MIT with a degree in aeronautical engineering. He would go on to design fighter planes during WW2. In 1946, he would design a prototype air-supported dome constructed of Neoprene-coated fiberglass fabric to protect radar installations in the Arctic. Nylon is introduced in 1935 at a DuPont research facility. Its first commercial use is a 1938 nylon-bristle toothbrush. Nylon was subsequently used as a replacement for silk in women’s stockings in 1940. Equipped with two sewing machines and the dedication to create fabrics with high standards of performance, Norm Seaman starts his business in a basement workshop in Canal Fulton, Ohio. The Seaman Corp., is incorporated in Ohio in 1950. Nohmura Tent Company is completely destroyed by air raid fire. Nohmura Sewing Factory is established in Osaka, Japan. Nohmura company name changed to Taiyo Kogyo Co., Ltd. Seaman Corp., maker of structural fabric, incorporated in Ohio. Dacron suits go on sale in New York City on May 8. The new material, produced by DuPont, is the first polyester fiber sold commercially and will later be used in medical devices and artificial hearts. Ronstan is founded in Australia when Ron Allatt and Stan Lenepveu open a manufacturing facility for wooden-hulled boats and their stainless steel fittings. Walter Bird and associates form Birdair Structures Inc. to create air structures for military applications along with pools and tennis courts. In November 1957, Bird’s own pool with its “bubble” top makes the cover of Life Magazine. By the 1960s, Birdair was creating huge “Radomes” to protect satellite tracking stations around the world. Ludwig Mies van der Rohe’s office specifies woven metal mesh by Cambridge International for the elevator interiors in New York’s Seagram Building. Bill and Vieve Gore found W.L. Gore & Associates in the basement of their Delaware home. Having left DuPont, Bill explores the potential of the polymer polytetrafluoroethylene, or PTFE. Their first product is an insulated wire cable. The first Ronstan catalog is published listing over 50 products. The 1964 New York World’s Fair features 160 temporary buildings and pavilions and strongly represents the American textile industry. Cooley Inc., a long-time IFAI member, provided the canvas for many of the Fair’s pavilions and umbrellas, joining Glen Ravenand Graniteville in coloring the scene with brightly colored textile structures and awnings. Frei Otto founds the famous Institute for Lightweight Structures at the University of Stuttgart. Stephanie Kwolek develops Kevlar® while working as a research scientist for DuPont. Made by spinning fiber from liquid crystalline solutions, Kevlar is almost five times stronger than steel but has half the density of fiberglass. Frei Otto completes the West Germany Pavilion at Expo 67 Montreal. Bill and Vieve Gore’s son, Bob Gore discovers ePTFE thereby opening an entirely new line of medical and fabric products for the company. The first ePTFE products to be commercialized are Gore-Tex® Pipe Thread Tape and Gore-Tex® Joint Sealant for industrial pipes. Taiyo Kogyo constructs membrane structures at Expo ’70 World Fair in Osaka with engineering by Birdair Structures Inc.
Frei Otto completes the Tuwaiq Palace, Saudi Arabia, with Buro Happold. Saint-Gobain and Pont-à-Mousson merge to offer complementary products in the building, automotive and service markets. Walter W. Bird, president of Birdair, claims he is helping to build “a new and better America.” During this time, Bird shifts his focus away from air-supported domes and onto more permanent membrane structures. Yet, Birdair continues to build air-supported stadiums throughout the 1970s and 80s. Since its founding in 1956, the company has completed more than 1,200 installations, utilizing more than 30 million sq. ft. of architectural fabric membrane. Frei Otto completes the roof for Olympic Stadium, Munich. University of LaVerne, LaVerne, Calif. completes the Student Activities Center, the first permanent glass fiber fabric structure in the U.S. Constructed by Birdair, the PTFE-coated fiberglass roof is manufactured by ChemFab with fibers provided by Owens-Corning and PTFE from DuPont. Ferrari Textiles (now called Serge Ferrari Group) invents a process of weaving with prestressed yarns in both weft and fill directions (Précontraint) of its PVC-coated polyester structural fabric. Ronstan increases its catalog range to over a thousand sailing-related products ranging from cam cleats to cables. By 1977, Ronstan was exporting to 29 countries. Gore & Associates fiber is used in space suits designed for astronauts on the Columbia,NASA’s inaugural space shuttle mission. Ronstan’s international profile is boosted when it fits out the America’s Cup winner, Australia II. Taiyo Kogyo completes the Tokyo Dome, Japan’s first permanent air-supported structure. Taiyo Kogyo acquires majority interest in Birdair, Inc. of Amherst, New York. Balance of interest is held by Chemfab Corp.
DuPont gives a Plunkett Award to Gore for the Gore-Tex® Radome Laminate, which protects radar antennae from harsh chemical and environmental conditions while minimizing microwave transmission loss. Ronstan branches outside the marine industries with stainless steel rigging components for the architectural and construction applications. Taiyo Kogyo acquires all stock in Birdair, Inc.
Ronstan produces its first architect-specific lecture. Major architectural projects using Ronstan products include the Kuala Lumpur International Airport and the Darling Harbour project in Sydney showcasing the use of wire balustrading previously used only in boats. Birdair, Inc. acquires Stromeyer & Wagner to serve European market. Frei Otto consults on the roof structure design of the Japanese Pavilion at Expo 2000 in Hanover Germany collaborating with Buro Happold and architect Shigeru Ban. Cambridge International opens Cambridge Architectural devoted to building applications of metal fabrics. Serge Ferrari creates Texyloop™ with JV Solvay to recycle PVC-PE fabrics. Designed by Herzog & de Meuron and ArupSport, the Allianz Arena opens in Munich. It is constructed with 2,874 ETFE-foil air panels that can be illuminated with a range of colors. Saint-Gobain focuses its significant R & D resources on: Solar power, lighting, intelligent glass, high-performance insulation systems, external wall insulation systems, applying green chemistry to their materials, solid oxide fuel cells (SOFCs), energy efficient manufacturing processes with a smaller environmental footing.